Dry gluten, the main protein in wheat, or “Fu” in Japanese is a major ingredient in Japanese cuisine, especially in Okinawa. 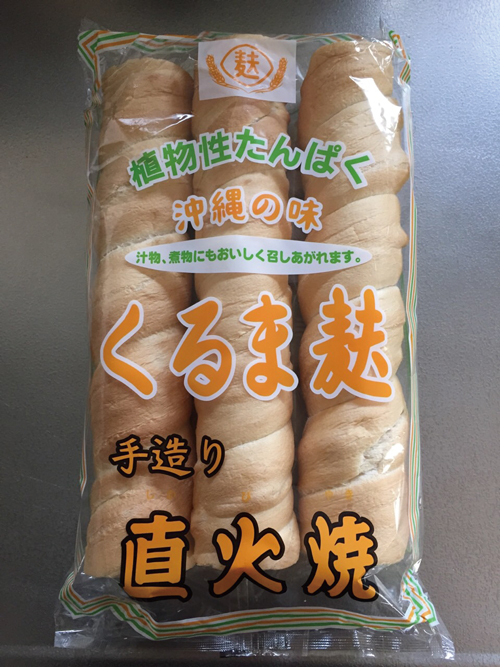 Some other types of gluten ingredients are sold in mainland Japan but Okinawa has the highest consumption of dry gluten in the country, and it’s mostly eaten as “Fu Champuru” that many of you may have heard about. The most common type of fu in Okinawa is “Kuruma Fu” that looks like a thick yellowish stick resembling bread with an air hole in the middle. You can buy it in any supermarket on Okinawa as it’s much used in Okinawan cooking. Please try it!